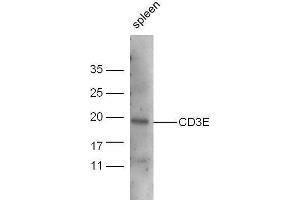 Mouse spleen lysate probed with Anti-CD3E Polyclonal Antibody, Unconjugated at 1:5000 for 90 min at 37˚C. Chenna Narendra, Chalise, Magnusson, Uppugunduri: "Local but Not Systemic Administration of Uridine Prevents Development of Antigen-Induced Arthritis." in: PLoS ONE, Vol. 10, Issue 10, pp. e0141863, 2015 Method employed by authors: Immunohistochemistry (Paraffin-embedded Sections) (IHC (p)) (Sample species: Mouse (Murine)).